The International Wolf Center relies on financial and in-kind donations from members and donors, foundations, corporations and wolf enthusiasts around the globe to advance our mission. 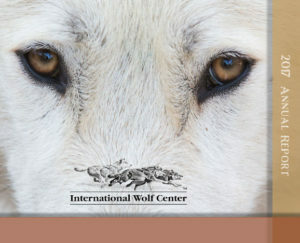 Below are PDF’s of our annual reports, audited financial statements and IRS form 990’s for the International Wolf Center’s previous years’ operations. Audited financial statements are available upon request from the development director, or you may view past Form 990’s filed with the State of Minnesota. The year of 2017 set landmarks for the International Wolf Center in more ways than one, but perhaps one month stood out among the others. March was a milestone month for the Center, as Ely staff reported that its 1,000,000th visitor attended the What’s for Dinner program on March 25. The community helped celebrate the event on Earth Day in April. The Center made a $1.2 million proposal to the LCCMR to fund the design and construction of an innovative wolf Discovery Center to replace its 35-year- old Wolves and Humans exhibit. The Center’s Board allocated $100,000 in matching funds for the grant and sent out requests-for-proposal to museum design studios. The 2017 temporary exhibit by Heidi Pinkerton featured one-year old wolf pups Axel and Grayson and research by Dave Mech on wild arctic wolves on Ellesmere Island. Heidi also received the year’s Who Speaks for Wolf award. With plans for the event underway, international speakers were invited to participate in the Center’s 2018 Wolves in a Changing World symposium set for Oct. 11-14, 2018 at the Minneapolis Marriot Northwest in Minneapolis. An expanded billboard program funded with a grant from the IRRRB and a match by the Center was partly responsible for an uptick in attendance at the Center. With grant funds for the Centers Wolves at our Door program due to run out, the Board decided to fund the program through 2018. The successful program has brought wolf education programs to more than 49,000 classroom students from 2014 to Dec. 31, 2017. With the help of the Center’s donors, members and volunteers, board members and staff made innovative strides for the future. In the new year we will look forward to work on an exciting new Discovery Center exhibit and an international symposium. Thank you for your support, which makes possible our essential educational work to support the survival of populations. Read more about what the International Wolf Center accomplished in 2016 with the help of our generous members and supporters.